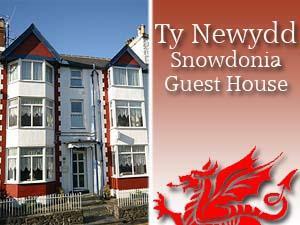 Ty Newydd Guest House Guest HouseTy Newydd Guest House is a large Victorian house with character, offering friendly service and comfortable accommodation with full Welsh Breakfast. All rooms are Centrally heated with double glazing. All have television, beverage trays and many extras for our guests' comfort. Our two double ensuite rooms are spacious with large bay windows, tastefully decorated. One is large enough for an extra bed for family use. We have one single room and on twin bedded room overlooking the back garden. There is a TV lounge with satellite TV. We have a spacious dining rooms and a drying room for wet walking/cycling guests clothes and boots. There is a free car park 80 mtrs away. Ty Newydd Guest House is a large Victorian house with character, offering friendly service and comfortable accommodation with full Welsh Breakfast. free car park 80yds local pubs/restaurants nearby Children welcome from any age. Situated on the main road and in village centre,there are three steps to entrance. Ground floor lounge and dining room., All bedrooms are on first floor, there are total 15 steps with handrail, a toilet with sink, and a bathroom with large bath and shower, toilet and washbasin on first floor, along with 3 letting rooms, 2 being en-suite with shower cubicles. there is a fire alarm system with emergency lighting. Due to the size and structure of the property no major alterations ( i.e.lift) are possible. Large buttoned payphone in reception. Remote controlled T.V.s in bedrooms and lounge. Waitress service breakfast. Porterage.